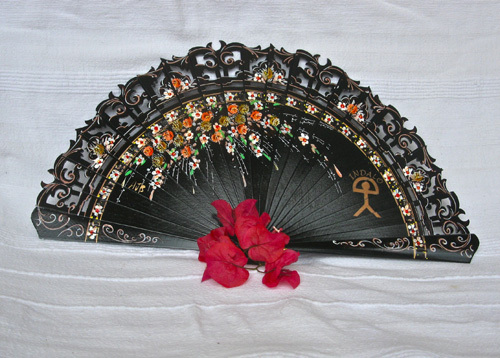 A rare gift from Spain - a high-quality, Spanish fan, handmade by master craftsmen in Andalucía, home of flamenco. Each one of these fans is a treasure . . hand-painted with delicate designs and signed by the fan artist: No single fan is the same. With the addition of the Indalo symbol, you have something totally unique . . a real collector's item. This beautiful, hand-crafted work of art would make a truly distinct and memorable present - something with meaning that is full of the mystique and atmosphere of Spain. Description: Fan measures 22cms (9") and 40cms across when open. It is made of lightweight wood with intricate cutout patterns and handpainted and varnished on both sides. Different designs available: Please choose from the options box when ordering. Please note, although each fan has a floral design and features the Indalo symbol, no two are identical. An exotic gift for a lady, that is both stunning to look at and practical too. 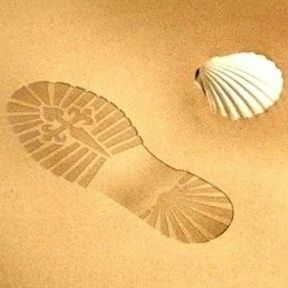 Unique product of Spain. Comes gift-wrapped, like all our presents (with an information card about the Indalo) - and we can print a personal message on your behalf.